It is now apparent that eating nuts is healthy for your cardiovascular system. Nut consumption also appears to reduce the risk of cardiovascular and overall mortality. While the evidence is not considered scientifically conclusive, the accumulated data is sufficiently compelling for the FDA to have issued a formal statement saying that eating certain nuts—almonds, hazelnuts, pecans, pistachios, walnuts, and peanuts—can reduce your risk of heart disease. How Much Evidence Is There on Nuts? Several small randomized trials have shown that eating walnuts results in a significant reduction in LDL cholesterol. In the Adventist Health Study, eating nuts more than four times a week was associated with a reduced risk of heart attack and of cardiac death. 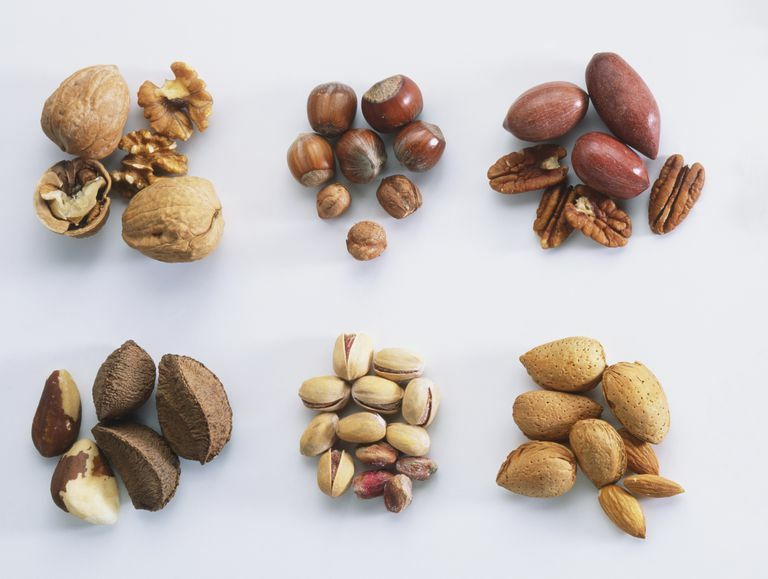 Systematic reviews that analyzed available studies on nut consumption showed that, for both men and women, eating nuts is associated with reduced rates of CAD and other cardiovascular diseases, as well as reduced mortality from all causes. The question often arises as to whether the same benefits are seen with peanuts, which are technically legumes, not nuts. The answer is, simply, yes. Peanuts contain the same beneficial stuff as "real" nuts, and have been associated with the same cardiovascular benefits. Nuts are loaded with calories. A handful of nuts contains about 150 calories. So, while they should be included in a heart-healthy diet, they shouldn't just be added, they should be substituted for another source of calories. Otherwise, the benefits might be negated by your expanding waistline. Nuts with a sugary coating add even more calories to your diet. If you have hypertension, salted nuts may cause problems with your blood pressure. Brazil nuts contain a relatively large amount of saturated fats, and have not been associated with reduced cardiovascular risk. When should you eat nuts? There's no perfect time. You can enjoy a serving as a snack, or sprinkle some on your salads, or even use crushed nuts in place of crusting and breadcrumbs on proteins like fish. Plain nuts are best—not coated in anything, and not salted. To avoid nut-induced weight gain, substitute nuts for something else, especially processed foods and unhealthy snacks or sweets. Add some nuts to your salad, pasta dishes, and fish dishes. Fraser GE, Sabaté J, Beeson WL, Strahan TM. A possible protective effect of nut consumption on risk of coronary heart disease. The Adventist Health Study. Arch Intern Med 1992; 152:1416. Albert CM, Gaziano JM, Willett WC, Manson JE. Nut consumption and decreased risk of sudden cardiac death in the Physicians' Health Study. Arch Intern Med 2002; 162:1382. Food and Drug Administration. Qualified health claims: Letter of enforcement discretion—Nuts and coronary heart disease (Docket No 02P-0505). 2003. Available at http://www.fda.gov/. Bao Y, Han J, Hu FB, et al. Association of nut consumption with total and cause-specific mortality. N Engl J Med 2013; 369:2001. Luo C, Zhang Y, Ding Y, et al. Nut consumption and risk of type 2 diabetes, cardiovascular disease, and all-cause mortality: a systematic review and meta-analysis. Am J Clin Nutr 2014; 100:256.